Back control, together with the full mount, is at the top of the positional hierarchy in Brazilian Jiu-Jitsu. In this article, we will take a look at the use of this position in BJJ versus other arts, as well as its importance in modern BJJ, grappling, and MMA. While Brazilian Jiu-Jitsu has distinguished itself from the other grappling arts from the intricate use of the guard, it also differs in the importance it has placed on the back control position compared to other grappling arts. In BJJ, getting to the back is often the main goal of most grapplers, and it is considered the ideal finishing position for a vast majority of practitioners. It is undeniable that just like the guard, BJJ practitioners are the ones who have contributed the most toward the current knowledge regarding this position. First let’s take a look at a possible reason for this: pinning and time limits. Unlike other dominant positions such as side control and the mount, achieving back control is not considered to be a pin in other grappling arts such as judo or wrestling; in fact, achieving back control in wrestling is likely to have a pin called against yourself (as both shoulder blades would likely touch the mat). In judo, while back control is allowed and the two most common submissions, the lapel choke and the armbar from there can be seen in competitions, the limited time available to work before a stand up means that most submissions from the back in judo are usually done fairly quickly, usually as a response to an opponent’s failed forward throw. See the video below for Travis Stevens’ bow and arrow choke that he used to win the semi-finals of the Rio Olympics 2016. By contrast in BJJ, back control awards the back taker with the most number of points (4) under IBJJF rules, together with the mount. Even in non-IBJJF rulesets, back control is also typically the highest scoring position. We should also note that under the IBJJF ruleset, when you achieve back control or the mount, there is no such thing as ‘stalling’, which differs from the other positions. Again, this is due to the importance placed on the position at the top of the positional hierarchy. But what about submissions, you ask? 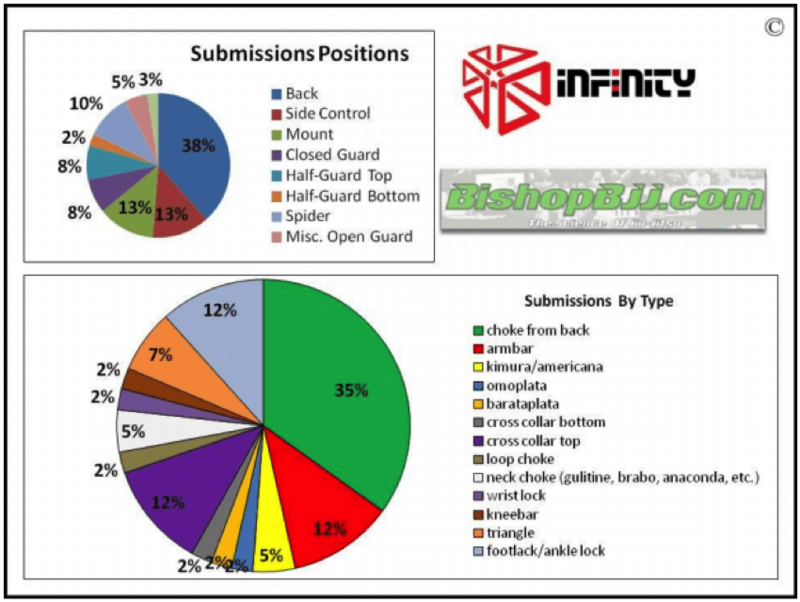 Well, in BishopBJJ’s study on the 2012 IBJJF World Championships, he found that 38% of all submissions were from the back control, with 35% of ALL submissions being the bow and arrow choke! Back control is also probably the best position in which to defeat a larger opponent, and as such, most BJJ practitioners have a highly developed back control from constantly rolling with larger and stronger people. Even in submission-only tournaments, back control reigns supreme. As mentioned in the article on the full mount, in no-gi submission only tournaments, the mount position can actually be dangerous for the top grappler due to the ability of the bottom grappler to escape directly into dangerous leg entanglements. In terms of positions, in such tournaments, the goal is usually to achieve back control or an advantageous leg entanglement. Look no further than EBI, where in overtime rules, participants always choose to start from back control rather than the spiderweb position. Further, members of the ‘Danaher Death Squad’, who have won every EBI they have participated in, are also known to have strong back control positions and frequently finish their opponents with the rear naked choke, in addition to their leg attacks. What about in MMA, you ask? Well, it is no different. In terms of submissions, the rear naked choke reigns supreme. 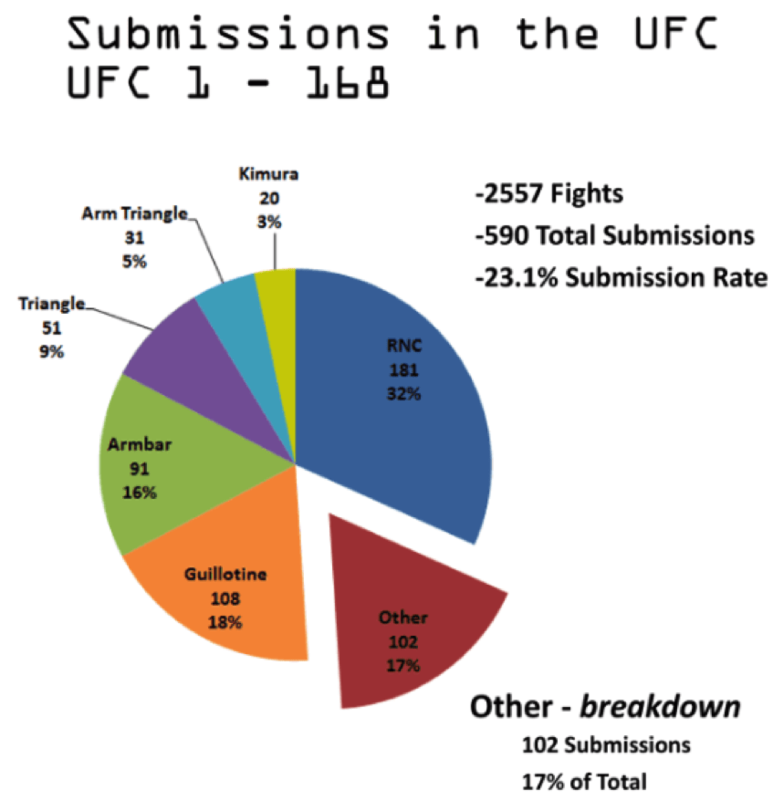 A member of the Underground forum did an analysis of all submissions from UFC 1 to UFC 168 and found that the rear naked choke comprised 32% of all submissions! To conclude, statistics have shown that back control is the position from which you have the highest probability to submit your opponent, whether in BJJ, submission grappling, or MMA. Most of the top BJJ practitioners in the world today are extremely skilled at obtaining and finishing from the back (see: Rafa Mendes, Cobrinha, Marcelo Garcia, Garry Tonon, Kron Gracie, Gordon Ryan etc.). Even when strikes are allowed such as in MMA, the position still remains the king in terms of getting the submission. Demian Maia’s current run through the UFC welterweight division is a current testament to that fact. 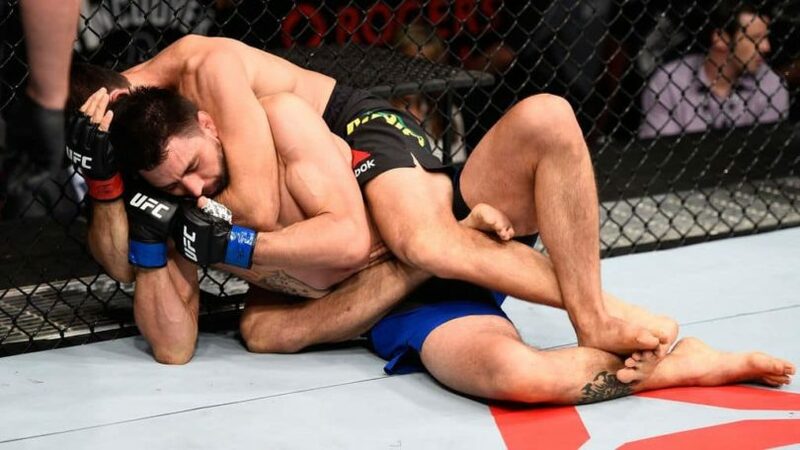 Finally, we note that the current trend of applying the rear naked choke regardless of whether it is underneath the chin or not (in both grappling and MMA) has likely increased the effectiveness of the position as well.